This 4.50-inches wide X 3.50-inches high fabric badge is for all Natsarim. For best results, use fabric glue or sew it on your hat, jacket, backpack, purse, headrests, or motorcycle bags. Yahusha is the Gefen (vine), and you are the Natsarim (branches) of His teachings. 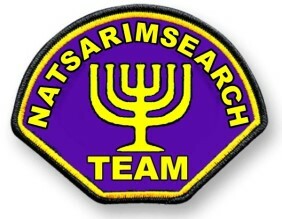 This fabric badge is high-density fabric with stitched edges, purple background, with yellow letters outlined in black. Be prepared to take every opportunity to give an answer to everyone that asks you the reason for the hope that is in you! Waterproof black & white vinyl stickers of this emblem are also being produced. See Detailed Image for a close-up view of this fabric badge.